KIEV, Ukraine -- Ukraine said it wants to postpone $3 billion of bailout repayments to the International Monetary Fund after holders of Greek government bonds agreed to the biggest sovereign-debt restructuring in history last week. PM Mykola Azarov wants to delay repayment of IMF debt by 10 years. Negotiations to restructure the debt, part of a 2008 rescue loan, for as long as a decade “are on,” First Deputy Economy Minister Vadym Kopylov said today in the capital, Kiev. The lender said Ukraine hadn’t asked to reschedule payments. “Why not? If we have Greece and such huge debts,” Kopylov told reporters, adding that Ukraine should delay repayments for 10 years. The former Soviet republic was granted a $16.4 billion bailout loan in 2008 as its main steel and chemical exports shrank in the wake of Lehman Brothers Inc’s bankruptcy, and agreed on a second $15.6 billion rescue package two years later. That loan has been frozen since last March after the government failed to raise household utility tariffs to balance the budget. The yield on Ukraine’s government bonds due 2013 rose to 8.027 percent as of 1:20 p.m., the highest level since March 1, data compiled by Bloomberg show. The cost of insuring state debt against non-payment for five years using credit-default swaps rose to 750 basis points yesterday from 747 on March 13. 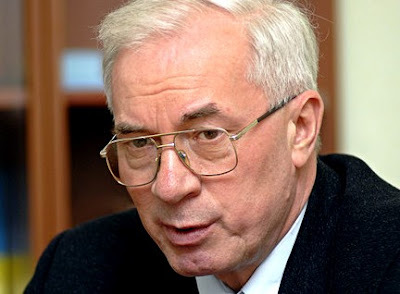 Finance Minister Yuriy Kolobov will visit the U.S. this month to meet the Washington-based lender’s new mission chief for Ukraine, Prime Minister Mykola Azarov said March 13. Ukraine repaid $575 million of debt to the lender in February and is due to repay about $3.1 billion more by year-end. “We don’t have any mechanisms to restructure or reschedule payments of the fund,” Max Alier, who heads the IMF’s office in Ukraine, told reporters in Kiev today. President Viktor Yanukovych, who plans to increase social spending by 16 billion hryvnia ($2 billion) or more before his party embarks on parliamentary elections in October, has repeatedly refused IMF demands to raise household natural-gas tariffs for households to stem losses at state energy company NAK Naftogaz Ukrainy. Instead, he wants to reduce the price his country pays Russia for imports of the fuel to about $250 per 1,000 cubic meters to bolster public finances after the central bank’s gold and foreign-currency reserves fell $3.3 billion to $31.8 billion in 2011. Rescheduling debt payments to the IMF would normally be possible if Ukraine’s latest rescue program wasn’t frozen, according to Tim Ash, head of emerging-market research at Royal Bank of Scotland Group Plc in London. There’s “little real perspective of the program coming back on track this side of elections,” he said by e-mail." The Finance Ministry picked JP Morgan Chase & Co., Morgan Stanley and Russian’s VTB Capital and Troika Dialog, which is controlled by OAO Sberbank, to lead manage a potential Eurobond sale, according to a Feb. 3 statement. Ukraine can wait until market conditions are right for a planned sale of dollar-denominated bonds as it has sufficient funds to cover debt payments, First Deputy Prime Minister Valery Khoroshkovskyi said Feb. 28. It’s also in talks to borrow cash from Russian banks and plans to refinance a $2 billion loan from VTB Group that matures in June, he added. Ukraine plans to expand this year’s state-asset sale program to 16.5 billion hryvnia ($2 billion) from 10 billion hryvnia ($1.2 billion) to fund additional social spending. Companies to be offered under the plan may include ammonia producer Odeskyi Pryportovyi, Kopylov said today.